We aim to carry out an effective check of the performance of your vehicle and trailer brakes – with as little inconvenience to you as possible. This guide gives you some clear and effective advice on how to achieve a satisfactory result from the brake-testing element of the MOT. 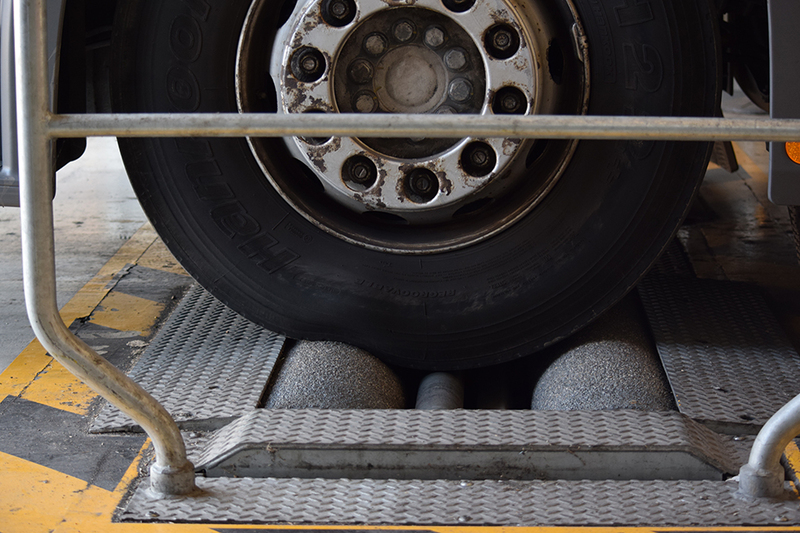 Vehicles must be fully loaded before being roller-brake tested because the grip between the tyre and the rollers is more effective that way. The wheels keep turning for longer, and a higher brake force will be achieved. If your vehicle is empty or only lightly loaded, the grip between tyre and the road (or the rollers on a roller- brake tester or ’RBT’) will be lower, and a relatively small brake force will cause the wheels to lock (stop turning). Once locked, no matter how much more the brakes are applied, the recorded brake force won’t increase. This means that if the vehicle’s load is too light, the wheels may lock before achieving the required brake efficiency. You shouldn’t rely on either condition during test preparations. If the wheels don’t lock in the actual test, the vehicle will have to meet the required efficiency. Remember: a locked wheel does not always mean a good brake. Authorised Test Facilities (ATFs) are responsible for making sure that vehicles are properly loaded before the MOT starts. This normally means at least 65% of the vehicle design axle weight (DAW). Note: our examiners can refuse to conduct a brake test if they’re unable to carry out a satisfactory one. The following table isn’t meant to be extensive, but outlines the circumstance under which we may allow an unladen test, and gives examples of vehicles that we think fit the criteria. The belief is that these vehicles aren’t able to be presented in the laden condition due to basic design limitations, or restrictions caused by the type of cargo they normally carry. Our recommendation is always: if you can load it, then do so! Dangerous and hazardous goods vehicles and trailers must be presented in line with the advice given in the Guide to the inspection of dangerous and hazardous goods vehicles. Remember: only in exceptional circumstances will we check the performance of the brakes when the vehicle is unladen. Present your vehicle loaded to at least 65% of design axle weight - unless exempt - and follow the DVSA brake test procedure. More guidance is available in the HGV inspection manual. Make sure you have a current version of DVSA’s DTp (now DfT) number database installed in your machine so that new vehicles are recognised. This will also remove the need to manually input vehicle details (which could result in the wrong FWA being used). You’ll need to decide what the vehicle’s braking needs are. These will help calculate brake performance. If your vehicle needs this type of test, please contact your ATF before booking to make sure they can do it. You should check brake performance regularly as part of a vehicle’s maintenance. It’s also a good idea to test brakes as part of the vehicle’s preparation for annual test. Maintain vehicles regularly, so that they meet the minimum standards when used on a road. Remember: a locked wheel doesn’t always mean a good brake! It’s important for all wheels to be able to meet the required standard. Unless exempt, the vehicle must be loaded whenever the vehicle is brake tested. It gives higher brake forces before wheel lock, which reflects the performance of the vehicle when in use. Use common sense, steam-cleaning the vehicle brake system immediately before test is highly likely to reduce the brake performance. It shouldn’t be necessary to alter the load-sensing valve settings outside of the manufacturer’s pre-set limit to achieve a satisfactory brake result. Altering the LSV settings can lead to over-braking of the rear wheels which is a potential road safety hazard. Vehicles are fitted with a secondary brake, typically either through a split braking system, or a progressively applied hand control valve. Make sure you know which type your vehicle has, and if the other system can be used as an alternative. is the vehicle sufficiently loaded? have all the brakes had time to bed in? are you aware of the correct method of inspection? is the RBT calibrated and in good condition? has the vehicle exceeded the minimum efficiency required in the manual?